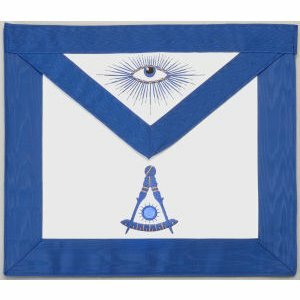 This beautiful Past Master Apron is hand embroidered using cotton embroidery thread and has Royal Blue Watermark Moire' Ribbon border. The apron has an adjustable web belt with a " T " hook closure, perfect for a waist line of up to 50 inches. This apron measures approximately 13" x 15" and has a blue satin lining with a pocket on the back. Please be aware that Past Master emblems vary between jurisdictions.Please specify if you require a Compass & Quadrant (Pictured) or Square, Compass & Quadrant.